With the return of holy Ganga Charri to Naraan Naag, Kashmiri Pandits three day long historic Annual Harmukh Ganga (Gangbal) Yatra 2014, organized by The Harmukh Ganga (Gangbal) Trust (Regd) (HGGT) and All Parties Migrants’ Coordination Committee (APMCC) at the mountainous North East Harmukh Range, 14500 ft above sea level concluded here on Wednesday after performing Ganga Ashtami Puja, Mahashradha of the departed souls of community and the culmination of Vedic Mahaygya . 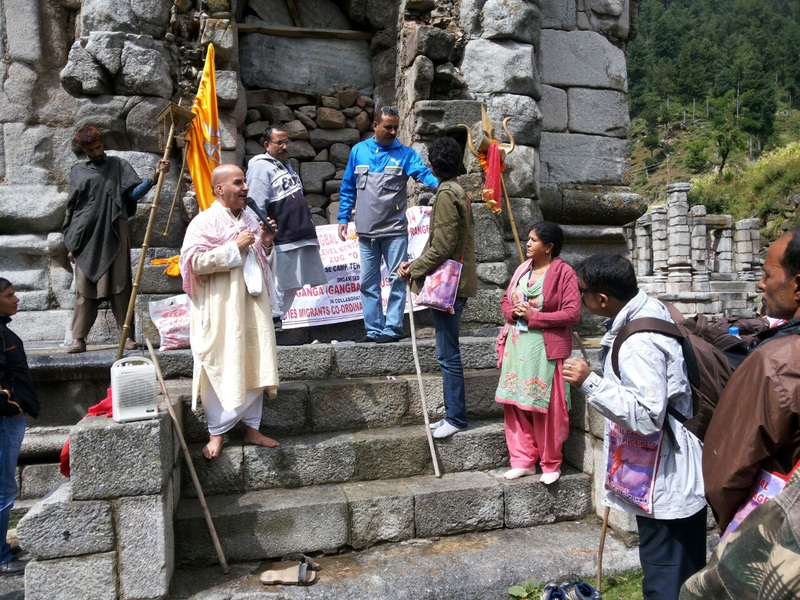 The Yatra started under the leadership of Vinod Pandit, Chairman APMCC and General Secretary HGGT on September 01 from Zyestha Devi Temple Srinagar and reached Naraan Naag where Charri Pujan of holy Ganga Charri was performed at historic Naran Naag temple and after trekking 18km long hilly terrain Holy Charri reached Gangbal the same day where Charri was installed and Ganga Puja performed amid religious fervor on September 02. The pilgrims consisting of scores of Kashmiri Pandit ladies also performed Mahashardha of the martyrs and all the departed souls of the community on the banks of holy Harmukh Ganga (Gangbal) where all the pilgrims participated besides performing sharadha of their ancestors, Vinod Pandit Chairman APMCC and General Secretary of the Gangbal Trust said. 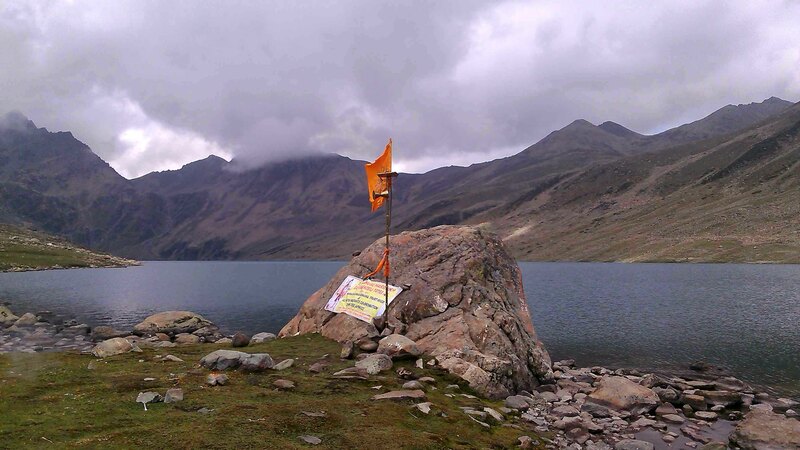 He said the sole trust Harmukh Ganga Gangbal Trust (Regd) (HGGT) authorized to conduct the yatra oganised annual Gangbal Yatra from September 01, 2014 to September 03, 2014 through proper registration and issuance of identity cards for security reasons during the Gangbal pilgrimage. King Bharati, Vice President of the trust in a statement issued after the yatra said that with the trust managing the activities of the yatra, the pilgrimage was managed in a well manner which benefited the pilgrims through well organised system of registration and other facilities being provided by the HGGT during the yatra. Bharati said that the yatries assembled in Srinagar at Zyeshtha Devi Temple on August 31 and stayed there for night and on September 01 they proceed towards Naran Naag in Kangan Tehsil, of Ganderbal district and proceed on foot towards holy Gangbal lake same day for an 8 hour long foot journey after performing Charri Pujan of holy Ganga Charri at historic Naran Naag temple while on September 02, on the auspicious day of Ganga Ashtami a joint Maha Shradha of the ancestors and martyrs was performed alognwith individual Shradha by the pilgrims besides Ganga Ashtami Puja adding the yatries started return journey on September 03 after culmination of Vedic Mahayajna and reached Zeshtha Devi temple late night. Amit Raina from Delhi said that yatra was smooth despite heavy rainfall and winds adding yatries reached Srinagar safe and sound and thanked the district administration, police force and the Indian Army for their support in conducting the yatra smoothly particularly for providing security support and other courtesies during the yatra. Ravinder Badam a senior member of APMCC thanked Zeshtha Devi Temple Prabhandak Committee and its president BB Bhat for providing all sorts of help to yatries during their stay on August 30 and on September 03 when the yatries stayed at the temple and relaxed after the yatra. Arun Kandroo Gen Secy APMCC while deliberating on the issue said that the yatra has seen significant growth over the past several years adding this year lot of pilgrims joined the yatra for which APMCC extended all kind of external support. 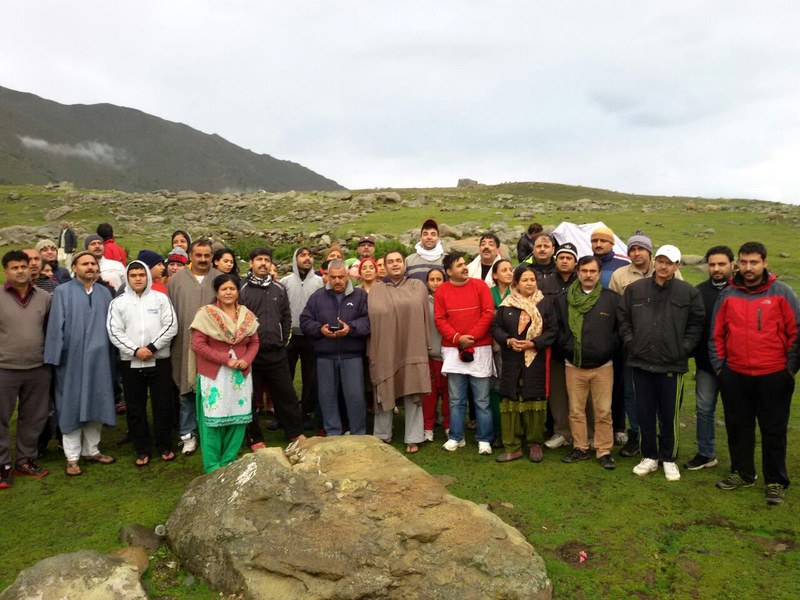 HGGT senior members who attended the yatra include Amit Raina, Rashnik Kher, Sunil Trakru (Punjab incharge), Ravinder Badam, Chand Ji Bhat, Ashok Singh Jamwal, Rajan Nakhasi, Sanjit Badam, Pradeep Pandita, Rajinder Raina, Pushpa Raina, Anoop Bhat and Baby Pandita and others.